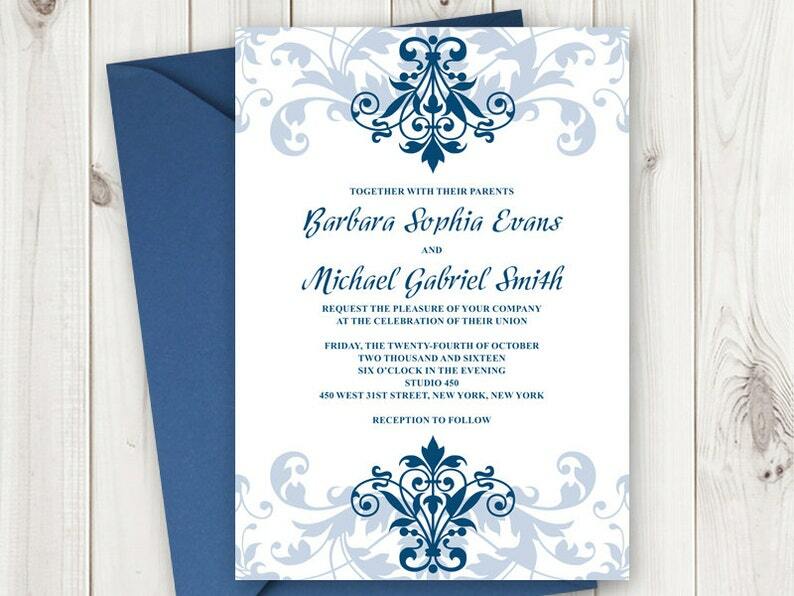 Printable Wedding Invitation "Elegant Ironwork" with Ornaments in Navy Blue. DIY Invite Templates. Editable Text, MS Word. Instant Download. DIY printable wedding invitation with navy blue ornaments "Elegant Ironwork". Classic and elegant design, easy to use. Instant Download after purchase. Edit your details in Microsoft Word and print as many as you need! Cut to trim marks and you'll be ready for your event in no time! Printable Wedding Invitation "Elegant Ironwork" with Ornaments in Plum Purple. DIY Invite Templat. Editable Text, MS Word. Instant Download. Wedding Invitation Template Tender Twirls, with Royal Blue Ornaments. DIY Printable Template. Editable Text, MS Word. Instant Download. Wedding Invitation Template Tender Twirls, with Purple Ornaments. DIY Printable Template. Editable Text, MS Word. Instant Download. Wedding RSVP Template "Elegant Ironwork" with Ornaments in Navy Blue. DIY Printable Response & Enclosure Cards. MS Word, Instant Download. Printable Wedding Menu Template "Elegant Ironwork", Turquoise Blue Green Gold. DIY Menu Cards. Editable Text, MS Word. Instant Download. Printable Wedding Invitation "Elegant Ironwork" with Gold Ornaments. DIY Wedding Invite Template. Editable Text, MS Word. Instant Download. Wedding RSVP Card Template "Cathedral" with Ornaments in Navy Blue. DIY Printable Response & Enclosure Cards. Editable Text, MS Word. Looks great. The files formatting made it a bit hard to upload it to a printing services website but other than that we are happy. Printable Wedding Invitation "Elegant Ironwork" with Ornaments in Navy Blue. DIY Wedding Invitation Templates. Editable Text, MS Word. Printable Watercolor Wedding Invitation Template "Lovely Leaves", Blue. DIY Nature Invite. Editable Text, MS Word. Instant Download. DIY Wedding Invitation Template "Elegant Ironwork" with Ornaments in Turquoise and Gold Wording. Printable Wedding Invite, Instant Download. Wedding Invitation Template "Vintage Roses", Aqua Green. DIY Printable Wedding Invites. Editable Text, MS Word. Instant Download. DIY Accommodations Card. Printable Wedding Insert Template "Elegant Ironwork", Plum Purple Color. Editable Text, MS Word. Instant Download. Wedding Invitation Template "Winter Frost", Blue. Printable Wedding Invites. DIY Wedding Invitations. Editable Text, Word. Instant Download.